We are playing a show with our friends Tauk this saturday at Spike Hill in Brooklyn. This show was put together to help out those still feeling the effects of Hurricane Sandy. The show is free, but donations are encouraged – with the donation of 10 bucks or a jacket you get a beer on the house, not to mention a karmic boost and a night of killer music, all for helping out people who need it. 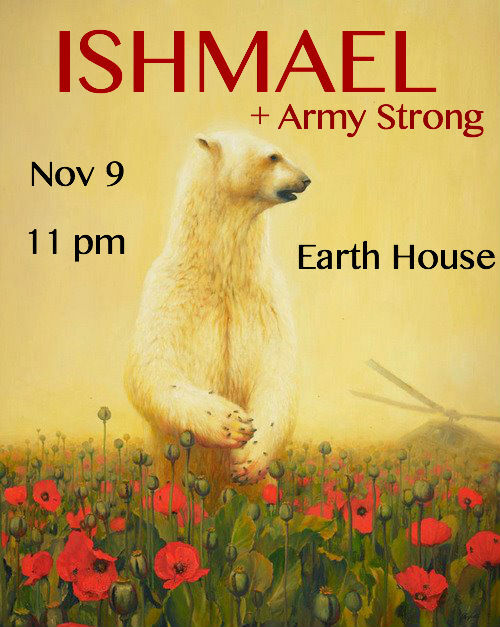 Ishmael will be playing some music this weekend at Wesleyan University. It’s been a hard week for New Yorkers, and we can’t think of a better way to blow off steam than getting warm with all our peeps, old a new, at Earth House by the warm light of rock. Our friends in Army Strong will kick off the night. RSVP on facebook. Also check out our new tumblr where you can see a little bit inside our minds. See you friday Earth House.